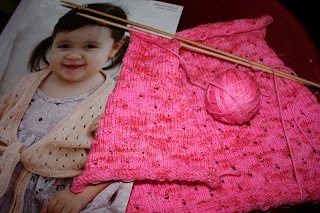 Fizz Knits: Disasters and Pawkies! I made a promise to myself that this month I was going to use up some of the yarn I have stashed away before I bought anything new. I started off with good intentions by knitting a wrap with some eyelash yarn I had. When I returned to knitting last year I bought quite a lot of eyelash yarn as it was all new to me and looked really unusual. I knitted a few scarves with it but hadn't tried to make anything else. I found the pattern for a wrap so thought I'd give it a go. I was using 15mm needles and the yarn is actually quite thin although hairy. After about five rows, I dropped a stitch and the whole thing just unravelled. So I gritted my teeth and started again and it did knit up pretty fast. Unfortunately I am not pleased with the finished article. My cast on was a lot tighter than my cast off edge, so they are uneven. The contrast yarn, which I am not sure if you can even make it out on the picture, had to be carried up the side and consequently that side is tighter than the other. So its a big misshapen drapy thing. But if you bunch it up round your neck you'd never know! However, I think its consigned to DDs dressing up box. 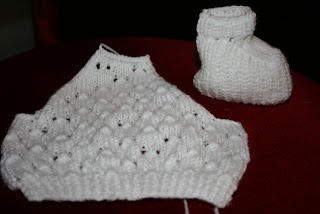 So after that disaster I thought I'd do something tried and tested and do a baby cardigan. I completed the back and thought it just didn't look right so I'm not going to even attempt to finish it. And don't get me started on the bootees I tried next. I only did one and look at it. It's horrific. 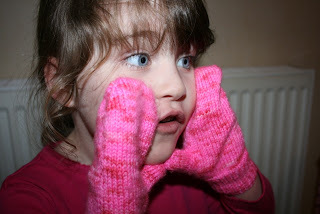 The first thing I did was a pair of pawkies (mittens) for DD who was very happy as pink is her favourite colour: Success at last! And I've started making her a short sleeved tie-fronted cardy. So far I've done the back and 3/4 of the left front and I'm still on my second skein, that's including the yarn for the pawkies! So I'll definitely be getting my moneys worth out of this purchase. 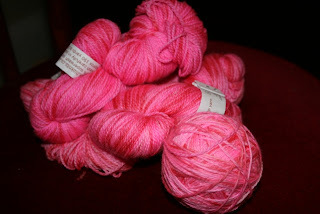 The yarn is so soft and silky, I'm very impressed. I might even use the leftovers to knit some socks! This post has taken SO LONG to do. I moved the computer today and when I turned it back on its running so slowly and Outlook appears to have vanished so I have no email. Fantastic. 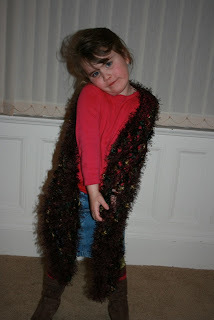 I remember my first efforts knitting with mohair. Not a pretty sight! Aha - 'pawky' is clearly a Fife word! Whenever I say 'What a pawky smile', all the folk here on the West Coast, and a few from the North East, look at me like I'm a nutter. No, pawkies are mitten type hand keeping warm type thingies................and I'm from Ayrshire.